It is that time of year. The time of year that we fill out endless documents that verify how much we have paid into the system and how much if any we will owe or get back. I hear it all the time I can’t wait to get my tax refund. I am going to buy “insert item that isn’t needed here”. This is How to Make Money Using your Tax Refund. The truth is a tax return is evidence that you are giving too much to the government and they are returning your surplus. People act like this is free money. It isn’t! It is actually your savings. I would suggest saving it. It isn’t what you save, it is what you spend. These are ways to make money. You need to pay down debt. You will save the interest you are paying to borrow that money. 1) If you have a large enough refund go ahead and make an extra mortgage payment or pay towards the principal of something you are financing. 2) Put it in a savings account and guess what save it for an emergency a real one. If you can pay cash you can often get a cheaper price. 4) Invest into something. We are currently investing about 3% – 10% of our income. That is what we could afford to lose. 5) Invest in something that is coming up in the future we have paid off all of our children’s college and the little one isn’t even in kindergarten. I estimate with the current rates for college we have already saved thousands of dollars and guess what we do not have to work if we do not want to because our kids are in school. 6) Use the money to further your education. I know that having a degree in something is or valuable then not having one. We made sure that my husband and myself obtained Master’s Degrees so that we would be paid $5,000- 15,000 more a year than we would have without them. It is also important to continue to learn new skills that will make you competitive in your job market. 7) Use the money to make a repair that is coming up and without the repair you would spend more money. We have our heater checked and we clean our vents to prevent future costs maintaining something is always cheaper than buying a new one. This is a great home repair checklist save money on home repair. 8) Use the money to help create a system for learning to manage and make money. They offer free classes in your community and online and even your banks are willing to help you. I would use my tax money to hire a babysitter and take the time to learn about wealth management. You most likely have heard the phrase “a penny saved is a penny earned.” I bet you do not know how to make the most off of each penny. You can even use the money to develop a system of saving whether it is the $5 savings plan for you or the envelope system or cutting coupons. 9) How about creating a double this tax refund contest for your family. You can find ways to save as much money each month as what you got back or maybe each quarter. The economic growth of your tax refund should be shared and curated by the entire family. 10) How about figuring out smart money savings tip to control your debt. Yes, that is right use your tax refund money to figure out how to control your debt. The smartest investment you can make is in your own future. 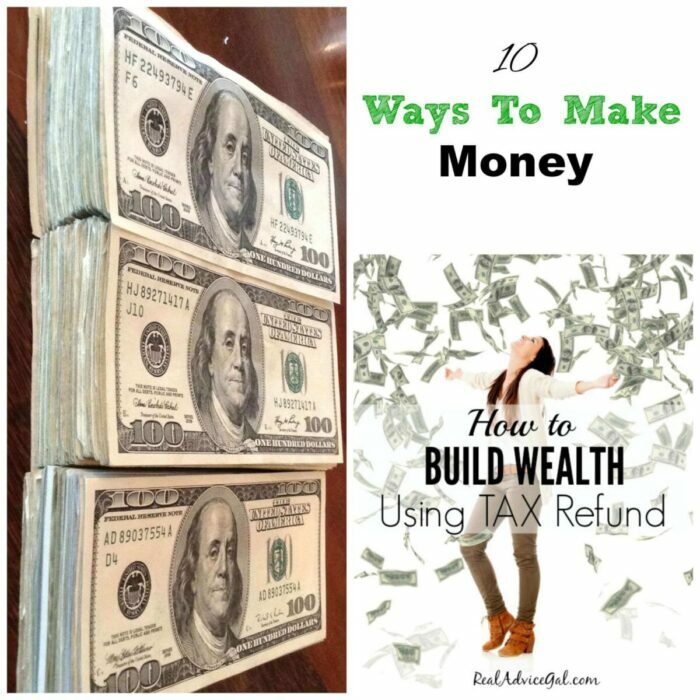 See Angie’s ideas on how to build wealth using your tax return she lives on 30,000 or less a year.